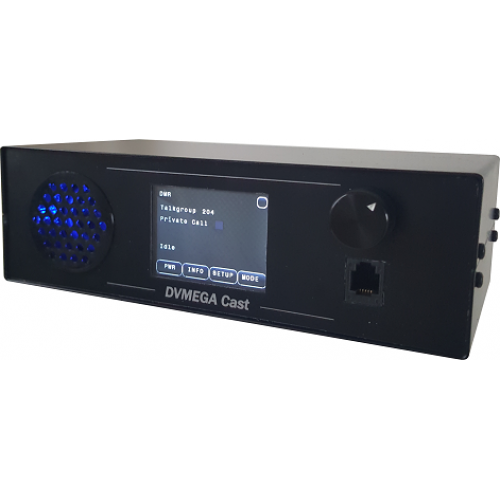 The DVMEGA-Cast is an internet based HAM-tranceiver, providing you with D-star, DMR, and C4FM (YSF and FCS). 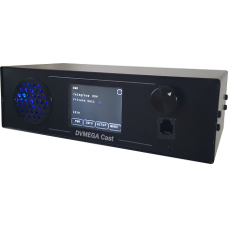 This rigid unit uses a 12VDC power supply (not included, option to add), consumes less than 1 Ampere (make sure to use a proper and clean powersupply, some switched powersupplies can generate interference), and has a nice touchscreen for selecting talkgroups and modes. Inside we have placed the AMBE3000 board (included), and a high-end CPU for optimal performance. An integrated speaker in the fornt-panel gives a loud and crisp audio on all modes. Inside of the speaker-area we added a color-LED, showing the unit-status. Pi-star is what we use as our base, which is one of the most reliable solutions. We added the web-interface for upgrading all modules in this radio, so no difficult menus. 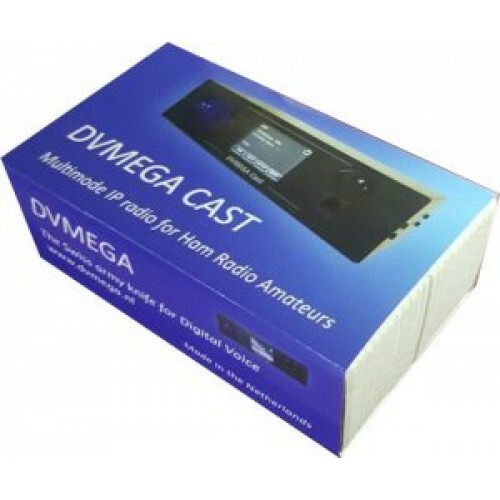 The DVMEGA-Cast can 'transmit' using a yeasu microphone (mh48 type, NOT INCLUDED), which is also available from our shop if you need one (choose as an option). The internet connection used, is up to you, wired or wifi (using the supplied small USB-dongle at the rear). 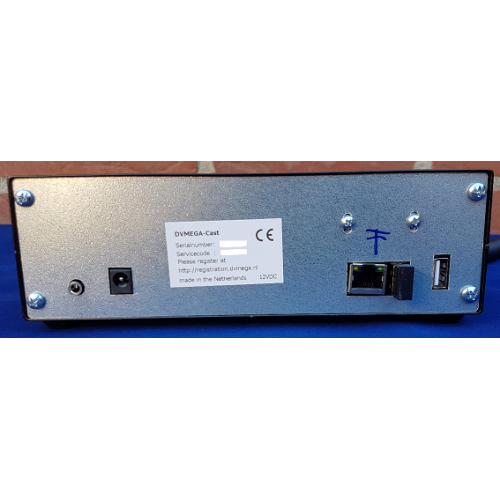 - Ethernetport for wired ethernet connection. The unit is high-end metal powdercoated, and its size is 20.5cm wide, 6.8cm high(incl feet), and 10.6 cm deep (volumeknob not calculated. note: This unit is fully functional, and we keep working on updates to improve the user-experience. We did not add the microphone by default as many people already own a Yeasu-microphone. Cast-Version 1.22 released, please check your email! instructions for recovering the microSD in this manual.